In August we showed you how Spiegel Online’s project - Expedition Beyond Tomorrow - is taking constructive journalism to the newsroom level. 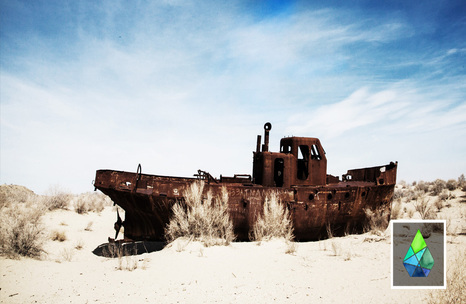 Today, we let you explore Die Welt’s year-long reporting on water issues. 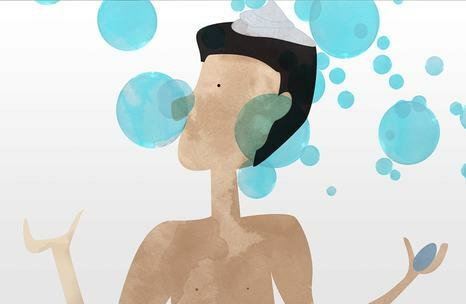 From the food we eat to the clothes we wear, almost everything consumed by us is somehow dependent on the use of water. Considering the high circulation of goods and services across the world, water is now more than ever an issue of global concern. A disputed resource, an endangered habitat, a controversial business and a prized luxury. 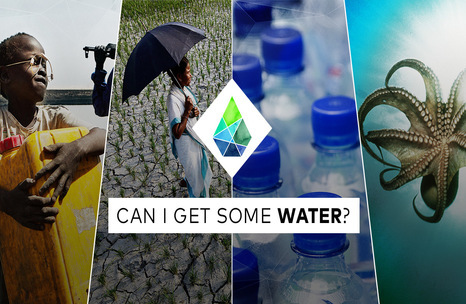 Through these four facets of water, Die Welt’s and N24’s year-long project “Can I get some water?” opens up new perspectives on this vital natural resource. Encompassing stories from different regions of the world, it explores the many fields entangled with water, ranging from environmental, political, to economic and social. All delivered through a combination of interactive features and longreads - in English and German. Sonja Gillert, the coordinator of the project, shared with us her thoughts on the theme and on the development of this monothematic multimedia project. Can you tell us briefly what is the main aim of “Can I get some water”? With “Can I get some water” we would like to shed light on water, which is an underreported natural resource. 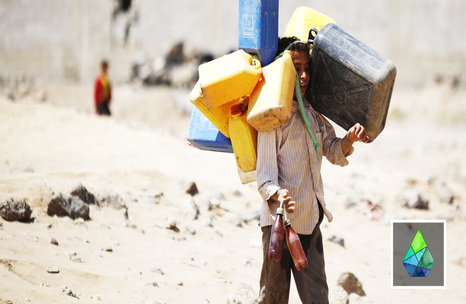 While much is discussed about oil, we are overlooking that the demand for clean water is becoming more and more urgent. Besides, we want to give to people who take water for granted, like Germans and other Europeans, a wider view on the resource. We do this by raising awareness on how water issues in other countries are connected to their daily lives. Which main topics on water addressed by the Global Goals do you cover? Three main Sustainable Development Goals focus on water related issues. The first aims to ensure access to water and sanitation for all on this planet. To discus this particular goal, we started with a multimedia report about an old gold mine in South Africa which contaminates some rivers and threatens the groundwater of the region. This report shows that even though the local population has access to water, it is not always clean. The second regards the conservation and sustainable use of oceans, seas and marine resources. To make this rather theoretical SDG more illustrative and easier to grasp, we produced a video report on scientists who are planting nearly dying out oysters at the coast line of North Carolina with the aim of purifying the water. A similar project takes place at New York harbour. And the third SDG refers to combating climate change and its impacts. One of my favourite stories, we are still working on it, is about residents of Oceania islands who know they will need to move due to the rise of the sea level. 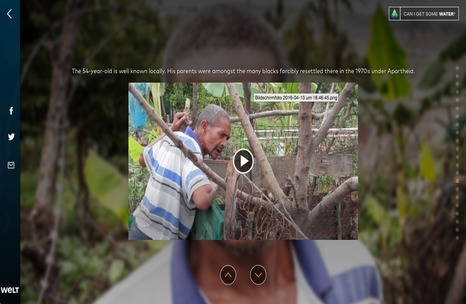 Through a multimedia report, we want to show their way of coping with this situation. You explore the water theme through four key aspects: water as a prized luxury, as an endangered habitat, as a controversial business and a disputed resource. Can you explain why are these four points so crucial to this debate? When talking about water on a nice evening with friends, most people have a natural scientific perspective in mind of water as a livelihood. This is very important, of course, but with these four key facts we want to make people more curious about different aspects of this natural resource, to make them question themselves about things such as why water can be considered a controversial business, where the business is and who owns water. Moreover, it is a nice way to give a structure to the whole big topic of water. Which unexpected viewpoints regarding water are presented in your stories? What was unexpected and surprising for me was that we came across very positive stories, where water brought people together and they found ways to cooperate. An example is our story on the Jordan river in Israel, in which we interviewed representatives of Israel and Palestine. While on the one hand there is a conflict among the two sides, on the other hand they really need to cooperate with each other in order to secure clean water from the Jordan river for their communities. For me personally was interesting to learn that although in Germany we have enough water, it is really important to make sure that our water remains clean. Because it is hard to clean polluted water, we should pay more attention to things like the types of shampoo and toothpaste we use. I always thought that the efforts should be put into saving water, but actually it is much more than that. What storytelling formats are you using to tell the stories? It is essential for us to find the right way to tell each story. Sometimes a story is more appealing if it is told in the format of a video, like for example a report we had about a sailor who was training for the Olympic games in Rio de Janeiro. He is sailing in a heavily polluted bay and, of course, you want to visualise what is going on there. 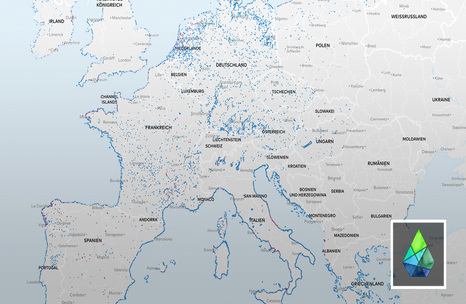 In the same manner, there are stories which can be better conveyed in the form of an interactive map, such as a huge data piece about the quality of all rivers and lakes in the European Union. At the same time, when producing multimedia stories, we try to not overload the stories so that the most essential - the message - can reach the audience. How are you using engaging elements in your storytelling? It’s very important for us to involve people and make them feel part of the story. With that in mind, every week we are publishing one new report, video or infographic in which we ask a question to the users. It can be a personal question, like for example “would you kill for water?”, or more general ones, such as “how many countries share water sources?”. 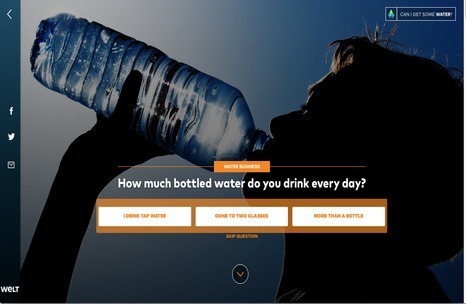 After answering the question, users are able to see how many people voted for each option and, subsequently, they get an introductory paragraph which is connected to their answers. Through this personalised experience, we aim to make them dive easier into the story. 360-degree virtual reality videos will also be part of your project. What can we expect? We have not published the 360-degree videos yet, but we really want to do that during the course of the project. I think it is a very unique and interactive way of experiencing different parts of the world as users are able to look around and move through the stories. Furthermore, this format is particularly useful in the case of water related environments like coral reefs, where the presence of tourists can in some cases threaten the preservation of the environment or in places which are difficult to reach. Through VR users are able to get information about these places and experience them without causing any harm. What audience do you aim to engage with your project and how? We have been trying to reach a broad and diversified audience by making use of different channels. With our app „Welt Kmpkt“, we want to engage the younger audiences in their 20s. On the other hand, with printed features, we are also reaching other age groups that are the traditional readers of the printed edition of Die Welt and the Sunday edition „Welt am Sonntag“. On social media, we use Facebook to reach a younger general public, while through Twitter we aim to engage with NGOs and people who are interested in water related topics. We noticed that the majority of the users of our Facebook page is between 18 and 35 years old, which is quite young compared to the regular audience of „Die Welt“. At the same time, two thirds of our visitors access the content primarily through mobile devices instead of desktop computers or laptops. Overall our aim is not to reach only experts, but the normal reader, so that we can think about water and maybe change our patterns. What is the team composition for such a complex project? It is a very diverse team with many different background and expertise. We have several reporters based in Berlin and elsewhere, as well as the colleagues from infographics, motion designers, the illustrator who designed the visual appearance of the website, back-end developers and front-end developers. From the technical and developing side, we learned how important it is to cooperate very closely with the team. We have been holding daily meetings during the last several months so everyone can be informed about how the project is going. It is impressive how many new ideas come up when people have a space to share their thoughts about an issue. What are the main struggles you have been experiencing while producing this innovative multimedia project? One major challenge was to coordinate all the production development, as well as the completion of the content. Many new ideas come up during the production process and often it is necessary to rethink your original ideas and start again. There are also the technical challenges involved in the development of interactive and fully responsive websites, which can be very complicated. To name just one: thinking and developing different versions of infographics for desktops, mobile phones or tablets. Apart from that, it is also challenging to set up a website in which you have new content just once a week, considering that we are used to publishing content several times a day for Die Welt. If a freelancer wants to work together with you on this project, how can s/he do that? What kind of stories, topics and formats are you interested in? We are very interested in stories which focus on innovative ideas and solutions for water related issues. Regarding the story formats, although I am very happy to hear new ideas, it is better for us if the person already knows the formats we have been working with. To integrate something completely different and open a new world within the project it is not as easy as we would like it to be. That’s why I would say make use of the tools we have already developed – which already allow to make very many different things possible. And I am very happy if you pitch us by email or by phone. What is the effect of “Can I get some water?” for Die Welt so far? For us it is a great chance to experiment with different storytelling approaches. Many of the team members have been trying out innovative formats and everyone is very happy about it. In addition, through the question-answer tool, for instance, we had some insights on how users prefer to be integrated into the story. This is something that we can apply to future productions. It is also a great chance for some of our reporters to do additional and intense on the ground research about water related issues. From a technical perspective, it also gave us insights on how to make different multimedia storytelling elements available on mobile devices, which is very interesting as more and more people are accessing news in this way. Internally, we also noticed that many colleagues are very engaged with the project and interested in its development. What long-term impact do you expect to achieve with the project? We really hope to widen the views on water and to raise awareness on the many different fields which are connected to this natural resource. Through interesting stories, we want to make people rethink their own water usage, leading maybe to a decline in water scarcity or an improvement in the quality of the water for some people. As reporters, we do hope to change a bit the reality. As a media organisation, we want of course to get more insights on what kind of stories and storytelling techniques are interesting for our readers. This will be an important long-term impact for Die Welt. So far it has been a great experience to work with a diverse team and various expertise. Despite all the bumps along the way, it has been fun and we hope to make it even better.